A popular glamping destination in Georgia, this three-treehouse rental in a secluded Buckhead neighborhood rents for $375 on Airbnb. Photo courtesy of Lindsay Appel / takeyouwild.format.com. Camping is a popular option for those looking for an escape within the state. But what about those who don’t enjoy waking up face-to-face with a praying mantis hanging onto the tent ceiling above them? Or those who don’t want to be stuck wandering for the perfect bush to hide behind? Those adventurers can rest easy because there’s a solution, and it’s called “glamping” – or glamorous camping. To get away from the hustle of Atlanta, look no further than Buckhead. 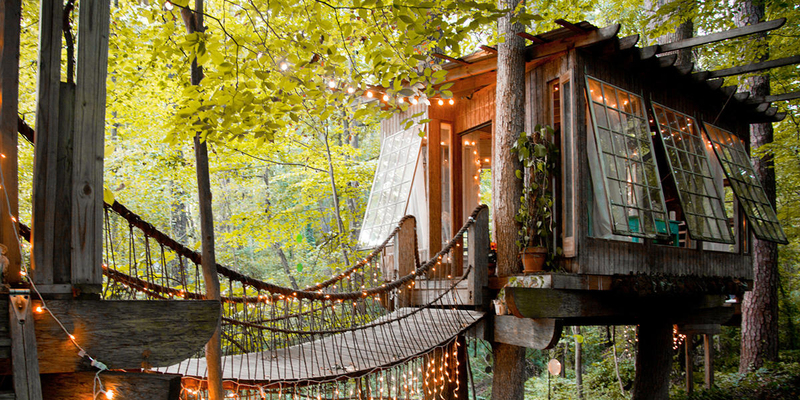 It’s home to one swanky Atlanta treehouse that is set back on a wooded lot near a creek. Owner Peter Bahouth originally built the triple platform treehouse as a space for him and his wife to get away and enjoy nature. Now it’s become a side hustle for the couple, who book guests from all over the world through Airbnb. Three separate tree houses connected by bridges make this space large enough for two people to stay, but children and pets are a no-no. 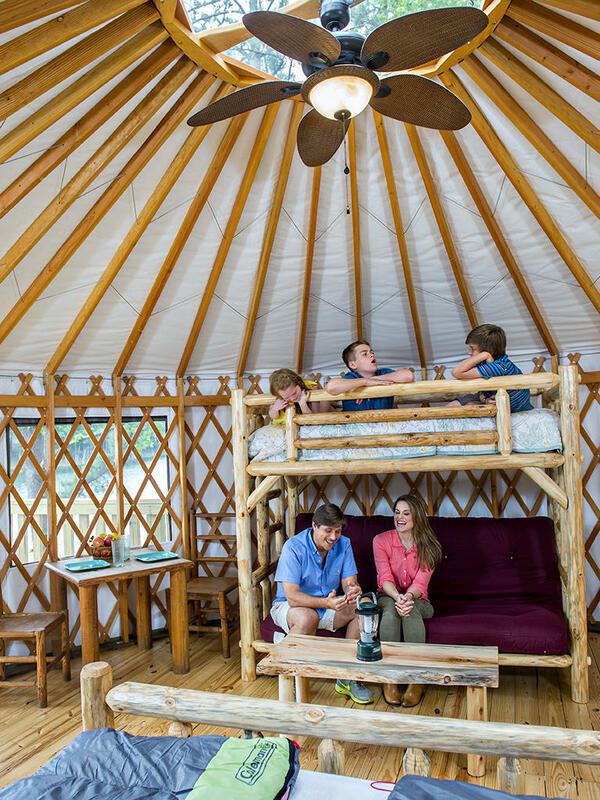 Yurts, or circular tents with modern amenities like beds and electricity, are also an option for the glamping set. 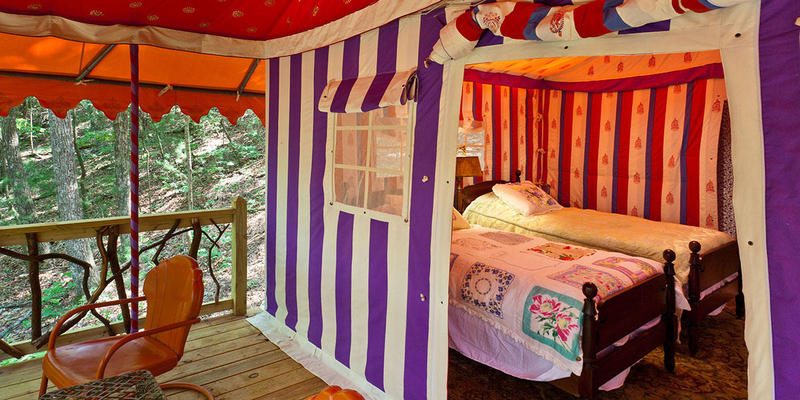 Stone Mountain Park offers six lakeside yurts for metro Atlanta glampers. Each yurt has air conditioning and heating, electricity and furniture, but campers still need to bring sleeping bags or linens. Children are welcome, but pets are not allowed. The interior of a Yurt at Stone Mountain Campground is completely furnished with log furniture. Guests are only required to bring their own linens or sleeping bags. Photo courtesy of Stone Mountain Park. The Cedar House Inn in Dahlonega, Georgia, houses two yurts for those who want to enjoy the outdoors without sleeping on the ground. “It’s an outdoor experience more private than staying in a building full of people,” Cedar House Inn owner Mary Beth Tanner said. The eco-friendly yurts offer the sound of nature at night with the comfort of a bed and breakfast. The yurts are also available for reservations all year. The Martyn House was ahead of the curve on the glamping trend, owner Joann Martyn said. While not exactly a treehouse or yurt, The Martyn House is still a luxurious “glamping in Georgia” experience. Four luxurious Indian sleeping tents are settled on the family’s farm in Ellijay, Ga., where they also have a bed and breakfast. While the family started renting the tents to guests in 2008, the Martyn House’s glamping tents achieved major status after a 2010 spread in Southern Living magazine. But it’s the chill atmosphere that keeps clients returning, Martyn said. “It’s a great place to just come and do your thing,” she said. Whether that’s painting en plein air or relaxing in the outdoor claw-foot tub with a glass of champagne, the Martyn House farm is a retreat for those who want to break away from a hurried lifestyle. A peek at the inside of a tent at The Martyn House in Ellijay, Ga., furnished with European antiques and luxurious bedding. They call this form of camping “glamping,” or “glamorous camping.” Photo by Rick Lucas / Lucas Imaging at The Martyn House. Tucked away in Lithia Springs, Sweetwater Creek State Park opened up its 10-yurt village last year. The yurts are fully furnished and have electricity. Bath houses are within walking distance. During the summer, the park also offers boat, kayak, paddleboard and canoe rentals at the George Sparks Reservoir. Located right off its sister island St. Simons, Little St. Simons is home to a hideaway known as The Lodge. If you’re not quite ready for an adventurous “glamping in Georgia” experience, these cozy cabins could be a good alternative. Guests can rent rooms, cottages and even the entire island. While there, campers can hike trails, walk along the beach, bird watch or fish in the Altamaha River. 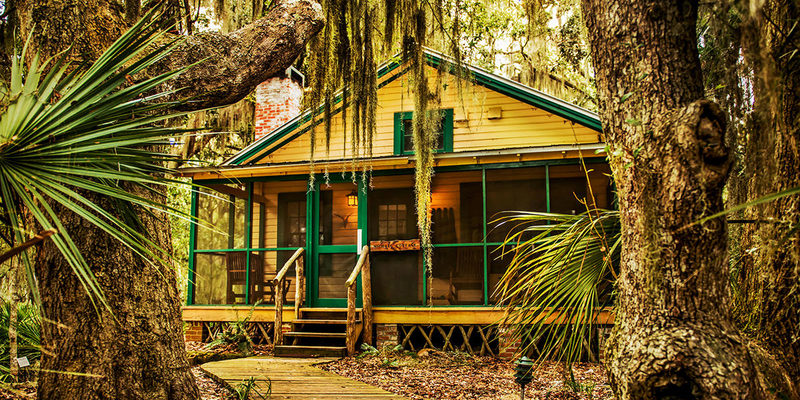 Little St. Simons Island’s The Michael Cottage, built in the 1930s, tends to be a favorite pick for families staying on the island. Photo by Cassie Wright / Little St. Simons Island. This article was originally published in 2016 at WABE.org.